The Vermont legislature passed Act 164 (2018) an act relating to bail reform. Section 6 of this law directed an “Incarceration Rates of People of Color Study”. The Vermont legislature passed Act 164 (2018) an act relating to bail reform. Section 6 of this law directed an “Incarceration Rates of People of Color Study”. What follows is a critical analysis of that report. 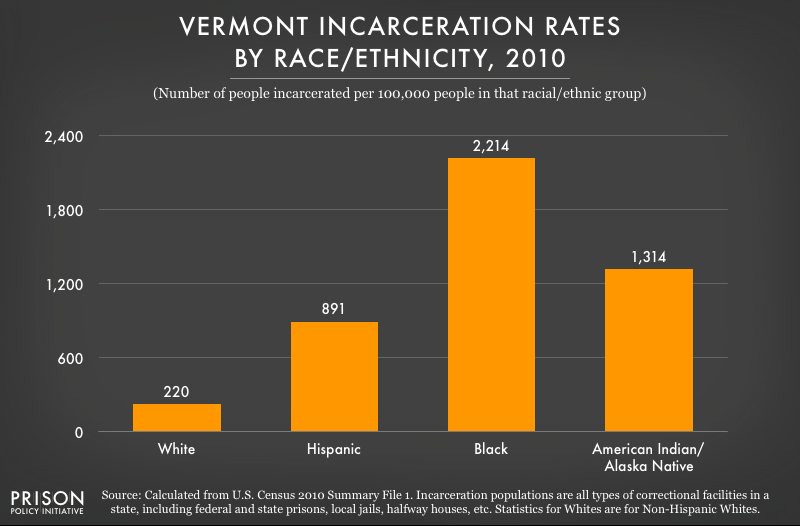 Attorneys and Sheriffs, and the Director of the Vermont State Police shall meet during the 2018 legislative interim to examine data regarding people of color who are incarcerated in Vermont. To the extent possible, the Committee shall also review data regarding people of color incarcerated in Maine and New Hampshire. regarding sentence lengths and incarceration rates of people of color. 1. The report request was to examine data regarding “non-white offenders “in custody”. The report expanded the scope to all which “were” incarcerated in 2017, hence providing misleading demographic information suggesting progress of a reduction of 11% African American incarceration to that of 8.5%. 2. The Executive Summary of the Report states that the commissioning authority is ACT 163 (2018). It is actually ACT 164. 3. The report is cited as a “preliminary report” but no follow-on intent is communicated. 4. ACT 164 calls for race, ethnicity of offenders. The report moves beyond the scope of this request to include gender and age, while failing to provide all data requested. 5. The report acknowledges a “flawed” data collection process in DOC. 6. A poorly explained Analytical algorithm referred to as “Chi Square Goodness Fit Tests” are used to arrive at the conclusion that the proportion of incarcerated blacks were under the so called “hypothesized” rates in at least one instance. 7. DOC reported not having sentencing length data for 2017.
a. frequency of charges issued to white and black inmates. b. frequency of drug charges issued to white and black inmates. c. sentence length between white and black inmates. d. sentence length across six race categories. e. frequency of Disciplinary Reports issued to white and black inmates. 9. Interstate comparison data is confusing and inconclusive. ACT 134 (2012) requested similar data. The report, delivered in 2015 included unsubstantiated assertions and was largely inconclusive due to unavailability of data. This report also fails to provide the substantiating data to support the conclusions. The black-box algorithms discussed in items (6) and (8) are analogous to “not showing ones work” to some very serious problems. Also troubling is the fact that (unlike previous reporting) the data set includes all personnel that entered the system in 2017. This fails to take into account that 80% of inmates are incarcerated for periods of longer duration and at any given day black people make up about 11% (not 8.5%) of the prison population. Finally, the development of this report was absent vital stakeholders throughout the process. Community members (specifically people of color) should have been involved. This could have been easily accomplished by simply routing this request to the Racial Disparities in the Criminal and Juvenile Justice System Advisor Panel.